So if you love Disney as much as I do, and you are always talking about your past or future trips, chances are that you may find yourself alienated from your friends and family from time to time. I love planning and talking about my upcoming trips to Walt Disney World almost as much as I actually being there (like I said… almost). I am passionate about my trips, but my friends and family don’t necessarily share the same passion. They don’t quite “get it”. So when it came time to start planning my next trip to Walt Disney World, I actually couldn’t find anybody who was either able or willing to go with me (I know, I am as shocked as you are -- they can’t be human). So what should I do? I could choose not to go and sit at home with an Annual Pass practically burning a hole in my wallet, or I could put myself out there and take a trip by myself. When I look back at it now, the answer was obvious, but at first, the decision did not seem so clear to me. Walt Disney World has always been a place that I have enjoyed with others. I love seeing people enjoy the same place that I have grown to love over the years. I have always visited with my family or best friend, so going by myself would be quite the departure from the norm for me. However, I REALLY wanted to go back “home,” so I just took a leap and put down the money on what would be the solo trip of my dreams. 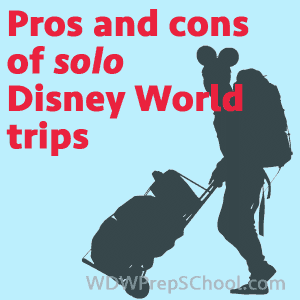 So with this very first solo trip behind me, I have put together a list of pros and cons for prospective solo travelers to Walt Disney World to consider. Here we go! Why should you take a solo trip? For this trip, I went back and forth on deciding to either stay at the Grand Floridian or Animal Kingdom Lodge. I have stayed at the Grand Floridian before when my family won a trip to Disney World back in 2001, and while I love the convenience the monorail brings to commuting back and forth to my favorite park (Magic Kingdom), I ultimately decided on Animal Kingdom Lodge because it was something different (and because it was cheaper). Being a solo traveler to Disney World really allows you to stay where YOU want to stay. I was actually able to stay at a Deluxe resort only because I was traveling solo. At the time, if I was going with somebody else, I would be paying for the majority of the trip for two people which would have ultimately resulted in us staying at Pop Century (another fantastic resort, and the one I really call my “home” resort). I think that a solo trip is the perfect time to splurge and stay in your dream resort. This is probably the biggest (and most obvious) pro for taking a solo trip -- doing what you want, when you want to do it. Traveling with others (should) always include compromise, but when you are traveling solo, you are only limited to amount of stuff you can get done or see throughout the course of your stay. If you want to be up early to catch the welcome show at Magic Kingdom park (totally worth it), you can do that. If you want close out the parks at night and enjoy little-to-no lines, you can do that too. If you want to ride the Carousel of Progress 8 times in a 5-day trip, yeah, you can definitely do that too (I did). Quick Service dining turned out to be a major pro for my solo trip. I ate at both Table Service and Quick Service restaurants throughout the trip, but it just seemed that the Quick Service worked out better. This type of dining (almost always) eliminates the need to be somewhere at a certain time or face a $10 no-show fee. Also, when traveling solo, your plans don’t necessarily need to be set so rigidly. As mentioned previously, when touring the parks alone, you can set your own pace without having to consider others and their needs. This type of touring works really well with Quick Service Dining because you can much more easily be spontaneous and decided where you want to eat at any given moment as opposed to sticking to dining reservations at certain times. Also, and this is on a more personal note, but I just didn’t care for dining at the Table Service restaurants without having somebody to talk to throughout the course of the meal, but this could definitely be a pro depending on you and your personality. This may seem somewhat contradictory what I just mentioned, but go with me here. If you do like the idea of actually sitting down and enjoying a Table Service meal alone, then I have some good new to share with you. From my personal experiences, I was able to get in every Table Service restaurant I wanted to eat at with very little difficulty getting a reservation even on a day or two beforehand. For example, a couple of days before I left to go on my trip, I decided that I wanted to eat at Be Our Guest for lunch on arrival day (I know that Be Our Guest lunch is technically a Quick Service, but it still needs a reservation). When I went online to make my reservation (at this point hopeful), not only was I able to actually get a reservation, but I was also able to choose between a few different times instead of having to go with the only one that shows up. This also worked on a few other restaurants that I decided to eat at last minute (Boma, Crystal Palace, and Via Napoli). Your milage may vary with this pro, but it was definitely an unexpected plus for me. You can’t take a solo trip to Walt Disney World and not take advantage of the single rider lines. I will be the first to say that the single rider lines at Walt Disney World does not necessarily mean “walk-on,” but they can be very advantageous when paired with FP+. I went to Animal Kingdom on arrival day, and even though I was there during peak crowd times, I was able to ride Expedition Everest six times in a row using the single rider line, and my longest wait might have been two minutes. I was also able to make a FP+ at Epcot for Soarin’ and used the single rider line to ride Test Track later that day. Rock ‘n’ Roller Coaster was the longest wait out of the three rides offering single rider, but I was still able to ride it three times within a 40-minute time frame. This allowed me to use my FP+ for Toy Story Midway Mania later in the day. This is a sort of bonus pro that I also “discovered” on my trip. Since it was just me, I was able to just walk up to parades and fireworks much easier than planning for a group of people who would need to take up more space. I just squeezed into the existing crowd with no difficulty. Even though there were a lot of pros to traveling solo, one very big con for me was that there wasn’t anybody to share the “magic” with. This is very subjective, and will not necessarily apply to all potential solo travelers, but it affected me more than I thought it would, so I felt that I should mention it. Being such a passionate Disney fan, I have found that I enjoy the parks even more when I taking somebody else with me and helping them to see Walt Disney World from my perspective as truly the most magical place on Earth. Because I was traveling solo, I didn’t get to do this to full extent that I really like to on other trips. Like always, I shared pictures and moments on Facebook and Instagram, but it just wasn’t the same as taking them around the parks and resorts in person, but again, your mileage may vary with this one. This could really be a pro or a con depending on the situation, but we’re gonna approach this from a con perspective. When traveling to Walt Disney World alone, you are left to be the sole traveler as well as the sole source of payment. If you are used to sharing costs for a trip to Disney, paying for the whole trip yourself can be a bit of an adjustment. Okay, so this was probably my least favorite part of solo traveling to Walt Disney World. Since I had booked my trip with a Disney Dining Plan, I had five Table Service credits to use. Even though I took the opportunity to try some new restaurants I had never dined at before, I often found myself rushing through the meal in order to leave and get back to touring. I thought it would be awkward or quiet eating alone, but I was wrong about that. The Cast Members, as always, did a great job of making me feel at home and I had some wonderful (and somewhat lengthy) conversations with some amazing cast members that made my trip a little more magical. If you enjoy spending time to yourself and relaxing alone, then this trip is probably for you. If you are a social butterfly and love spending time around like-minded folks, then this trip may also be for you (just for a smaller amount of time). Ultimately, if you do decide to take a solo trip to Walt Disney World, it is going to be what you make of it. If you are interested in taking a solo trip, I would recommend going for a long weekend and seeing if it is something that you really enjoy before trying to spend a whole week or so. It also helps to try to meet up with some friends who may also be in the area. Fortunately, I was able to meet up with my Disney travel agent (the amazing Cheryl from Key to the World Travel) and Shannon. Even though I spend most of my trip solo, I ended it with two lovely people watching some amazing fireworks. Great story!! I’m a Disney Pass-holder and I’m definitely will be making plans for a solo trip to one of the theme parks. Thanks for the inspiration. Ok! after taking my son and his family a couple summers ago, and being LESS THAN THRILLED at THEM having nowhere near my enthusiasm, I think I’m gonna do it! Thank you hitting on every point I was wondering about! I think I’m going to so solo this weekend on a whim. I’m a bit nervous because I’ve never been to WDW and don’t know what to expect. AHHH!! Okay, Zach. You’ve convinced me. I’m going to plan my solo trip for the time between Toy Story Land opens and just before Star Wars Land opens, my rationale being a lot of folks will be waiting to go until Star Wars opens and the park might not be so crowded just before then. That, and I’ve never been a big Star Wars fanatic. Thanks for giving me the courage to go for it! Good article. I’m a solo traveller and am going to WDW in September 2018. Going for a long weekend isn’t an option for me though because I live in the UK and the flights are 9 hours. I’ve been on solo trips to Disneyland Paris for a week several times so do have an idea of what it’s like to spend time along at Disney parks. So I’ve booked two weeks at WDW. That is great what you said going for two weeks solo to WDW. How was it ? i ask as i have been thinking of going back without the family as they tell me they dont want to to go back, i myself need to go so much i didnt do so this my chance . Any advice please im also from the UK. I’m off next week on my third solo outing to Orlando’s theme parks. I’m from the UK and I’m a massive Disneyland Paris fan, but I also travel for work to the US fairly frequently so I’ve popped a couple of nights onto the end of some of my trips. In Paris, we go as a family which is fantastic, but for the US solo trips I’ve found that the pros and cons listed here are spot on. I especially love being in charge of my own agenda… doing what I want to do, when I want to do it. My only tip would be to remember to load up some reading material onto your phone for the queues as there’s no-one to chat to. Although I did feel a little strange the first time I did this and thought people might think I was odd, in fact it’s been absolutely great travelling alone and I’ve loved every minute. It also feels very safe which is great when you’re a female travelling alone. I went alone for the first time 2 years ago to Disneyland when my partner wouldn’t go with and I had a great time. Been to Disney World twice now alone and all the pros listed are spot on. In addition, several times when cast members find out that I’m travelling alone are very friendly and you get to talk to them more. There is 1 con not listed though- as a single adult male, I seem to get stopped for extra security check more often (75% of entries), even though I don’t bring a bag or even a water bottle with me. Annoying, but doesn’t stop me from having fun. Hi. 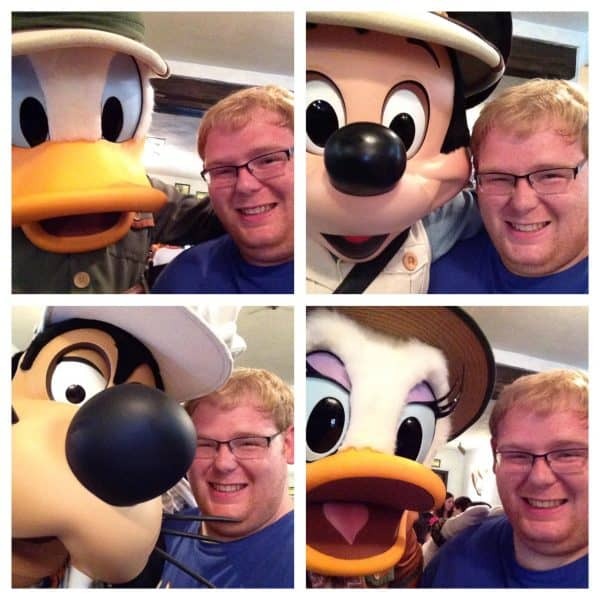 I went to Disney World by myself in July 2015 and it was an awesome time. I did not have to report to anyone or listen to anyone say they were tired. If I wanted to wait in line for a character photo op, I could. It was great talking to all the cast members and discover what countries they were from. I am trying to plan to go in December 2017 by myself. No one has as much interest as I do in going to Disney. And actually that is fine with me. While I agree, it is great to share it with someone, if I have to go by myself, I will. It is Disney Magic!! Even though your cons hit home with me, you’ve really convinced me to consider Walt Disney World as another solo destination. I have always wanted to go back to Florida, as an adult, as go to Disney World but I could never find anyone for so many reasons. I feel like I may never get to go back; cause it can be a bit pricey if you stay on resort. Having said that, who cares! That’s it. I am going, if not soon then eventually. I cannot let life pass me by simply because I can’t find someone to share my dreams with. I have been racking my brains where to go this winter and I think you have just convinced me. My dad was an Imagineer for 30 years, so I grew up on WDW. Now that I’m older, I’m at the parks literally every week. Most of my time is spent alone. The very first time I went alone, I was a little nervous. But it wore off quickly. For me, at least, going solo is a liberating experience. I can meditate on my thoughts and experiences, and really immerse myself into the parks. By nature I’m an introvert who HATES having to entertain people, so solo trips work for me. I have wanted to go for the last year, but had no one to go with. Wasn’t sure if going it alone would be worth maybe after reading this i will start seeing if maybe I could plan one trip soon even if it is only a short trip. Wow! Great story. Just what I needed to hear. Also, glad to see all the comments to know I’m not alone in how I feel. I too have been traveling to Disney every year for the past 14 years with my wife. However as we have since parted ways I have been wanting to go back. Scared as we just parted a year ago and can’t imagine how this trip will make me feel without her. But yet excited as I miss the park so much. I’ve never had issues traveling alone. But this trip will be different. Perhaps this trip will be the ice breaker I need to move forward for future Disney trips. Wish me luck! Great article! 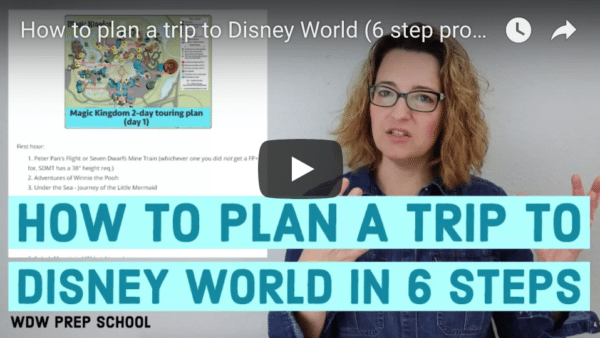 I struggle to find friends to go to WDW with me – and don’t think I’d mind a solo trip – if it weren’t for the cost of the room. I wish that Disney (cruise ships also!) would have some housing for solo travelers. I have extended family that goes – but awkward rooming with them – but would totally go the same time if I could afford a room for myself. Do you think Disney would ever consider this type of room offering? Great post. Thanks so much for sharing your solo experience. I am in Orlando for a conference right now and I was unsure if I should go solo or not. I haven’t been to the Magic Kingdom since I was about 13 (23 yrs ago) I thought it would be fun to check it out again. 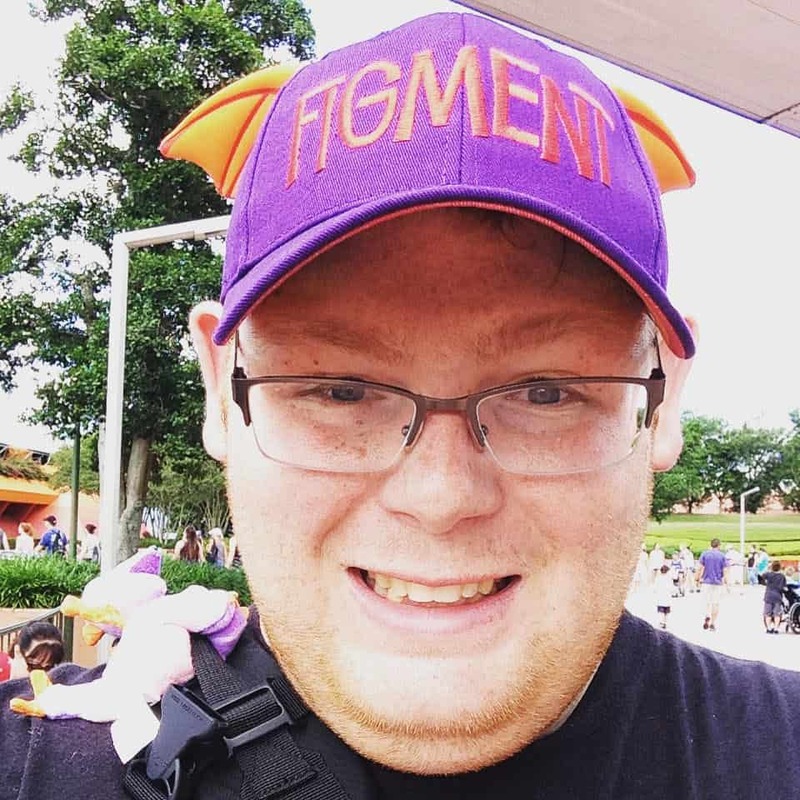 Chad: I did a trip to WDW solo a few years ago – I would absolutely recommend it to anyone! I spent 5 days prancing around like my 10 year old self, eating my way through Epcot (I coincidentally attended during the Food and Wine Festival), rode the rides as many times as I wished, and generally found the experience delightful! I recommend experience Disney at least once with out children or a travel companion! At anytime during your solo vacation, did you ever feel unsafe? My biggest fear is closing the park, riding the bus alone and then walking to my room solo. I love Disney. I would go every year if I could. But no one I know ever wants to go. 🙁 I would like to share the magic of being there with someone also but it’s only worth it if everyone loves it as much as you do. Reading your post is encouraging. I don’t want to miss out on Disney moments just because I can’t find a fellow Disney lover to go with. I’m going to go!!! I am headed to Disney World in October for a conference and I plan to do some solo touring while there. The experiences described in this post align perfectly with my expectations. I am very much looking forward to the trip. This is inspiring! My girlfriend and I planned on going to Disney and Universal this Sept 2016. Unfortunately our relationship came to an end. My initial reaction was to cancel the reservations immediately but I still really want to go. I’ve never traveled alone so I’m a little hesitant. Plus, being in my 40s, I don’t want to be considered a creeper. I just love the rides and can actually use the vacation now! This was SUCH a wonderful post! If anyone would ask me where I’d like my ashes scattered after I die, I would say “Disney World,” without a flinch (if it was allowed!). I have loved WDW since I was 12 and each time I have gone (probably about 30 times in my life), I have always felt a bit of a depression as I turned to look at the entrance to Main Street waving good-bye to me, and I never know whether I’ll ever return. This was even more so after moving from Tampa, FL to Vermont! But, alas, as life would have it, I am now in Atlanta and a car ride away. Yeiii! However, not so “yeiii,” my partner/spouse would rather have a limb amputated than go back to Disney World. He went once, for my birthday, for a five day wondertrip (for me — must be love). That was about it. He said if we could get another couple to go, he’d go back. Probably not happening. After turning 48 this year I realize life is too short to let time pass without going to WDW….so, finally I decided my next vacation, I’m going it alone, dangit! But, immediately, I felt a sense of extreme sadness. I saw myself boarding the flying ship to Neverland by myself, eating at Pinocchio Festhaus alone, riding Big Thunder Mountain Railroad alone, seeing the gorgeous Main Street Electrical Parade alone and going back to my room (which would be most likely at the Polynesian Resort) alone and, worse, going to EPCOT’s Canada Adventure alone…my partner being Canadian I’d probably break out in tears when the song starts at the end! Then I found this post. I have to admit that in my sadness, I saw your pictures of ‘alone at WDW’ and thought, “Wish you had called me, I WOULD GO!!! I figure there must be chat rooms for “Let’s become friends and go to WDW together so we don’t have to go alone” or even support groups for people like us…but….I can face this alone. If you did it, I can too!!! I solo it to Disney all the time. I love it! I definitely understand wanting to share the magic with a friends or family member. I would also like to mention, in addition to single rider lines, single riders in general can be sought to fill a vehicle. Often this has bumped me to the front of the line on Space mountain, Kilimanjaro Safaris, and Kali RR. I always enjoy my solo trips. Is Zach single? He’s cute 🙂 I did Disneyland by myself a few years ago and met up with my brother later in the afternoon. Was able to do everything I wanted to do on my time. I have been to WDW around 30 times since 1974, but 2009 was my first solo venture. My fiancé had to go to Orlando for a conference, so I went and took a car service to the parks during the day. Different experience alone- I agree with the author totally. I missed having someone to share the magic with, but had an amazing three days doing what I wanted as many times as I wanted to do it at my own pace. Had a ball! My server at a table service restaurant was from my tiny home state of WV and she chatted with me often so I didn’t feel alone at all. Would do it again in a heartbeat! Thanks for publishing this article. I’ll be doing a solo trip in April for the first time. It was very informative and helpful. I didn’t expect to come up with much when I Googled going to WDW alone, so I’m glad I found your article, Zach. I am happy to be back in Florida and purchased a Disney Platinum Annual Pass on January 1st. I am recently widowed and moved from Virginia back to Florida to the Tampa area to be near our only child. The 3 of us had enjoyed some of the best times of our lives at WDW and I intend to keep up the tradition! My son is very busy with his job and other things during the week and I am at a bit of a loss to find things to do alone other than shop. Since I am only an hour away, I thought it would be interesting to drive over someday by myself. Thanks for the encouragement to go for it! Does anyone know of a way to connect to other folks who are doing the parks solo?? Thanks for sharing this. I’m about to visit Disney World for the first time this New Year week and I was concerned about going alone but this reassures me that I’ll do just fine. I did it! Just made reservations for a solo trip in December. I’m going to CRUSH some Disney Bucket list items. In addition to the “solo” aspect, I am going to attend MVMCP and get to see Osborne Lights (the demise of which lit the fire under me to do this thing!) and the Candlelight Processional and visit lots of decorated resorts and check out the Christmas goodies at Disney Springs. OH YES I am excited! Thank you, Shannon, for running a website that gives me the confidence to do this. Hehehe… this is a slightly belated 65th birthday present to myself. Thanks so much for your review — I’m finally taking the solo trip plunge for the first time in December, as I could not find anyone to drag along with me, LOL! I’ve been to WDW probably ten times in the last decade, but this will be the first one by myself, and I’m interested to see how it compares. The biggest single expense is hotel, and I’m splurging this time, staying at Yacht Club so that I can walk to EPCOT. For me, there was only a few table service places that was a bit awkward to be by myself. But I found many of the cast members will engage in conversation, including one really nice waiter at Tony’s Town Square. The part I loved most about going solo when it concerns dining… I got to try a bunch of table service restaurants that I wouldn’t have been able to with my family…. Like the Dining Room at Wolfgang Puck Grand Cafe!! The food was to-die-for! I got to do my favorite attractions as many times as I wanted. Last December, I rode Tower of Terror I think 10 times. And… I got to skip things that don’t interest me that my family would have wanted to do. I want to take my husband and son on my next Disney trip. But after that, I’m definitely going solo again! Thanks for sharing. I’m in the early planning stages for a solo trip in February 2017. I can’t wait! This is fantastic!! We are recent Orlando residents and passholders and I am dying to spend a few days in the park alone! Having 3 kids really can slow you down! How amazing to be able to hit the shows you want, the rides you want, and walk at your own pace. I am a huge fan of solo Disney. I love taking friends to show them “my world”, but I really like doing it on my own. I love to sleep in until noon and stay out until 1 or 2 am. Disney at night is a totally different feel. All your comments I agree with. One trick I’ve learned – strangers you meet at a crowded event, feel sorry for me when they see I’m all alone. I tell them my family gave me the trip as a present to enjoy without kids. The strangers feel better and even envy me, and I have a good chuckle how I made THEM feel better! I know I am probably in the vast minority, but I would LOVE to see more articles like this! I’m in my 30’s, kids are a no-go for me, and not very many friends (and no family) like Disney. I find it almost maddening that I can’t find many articles on traveling the World solo! I also love watching YouTube videos on tips and tricks, but most are lost on me, because again, I’m planning a solo vacation! Thanks for sharing Zach, and glad you had a great time! Absolutely this. Same boat, and I’ve always been a fan of Disney and not a social butterfly by any stretch (in fact if the “cast” will leave me alone during dinners, I’d probably prefer that). But clearly WDW is not geared toward the solo traveler, and there’s a strong expectation you go to Disney with family or friends. Even worse when you’re a guy (I feel ladies get a bit of a pass where guys aren’t supposed to like this stuff as much without a wife/girlfriend pushing them… Probably inaccurate but that’s my feeling). Can’t fault Disney for that, but I wish travel blogs and info sources included this. Thanks for this! I’m one step closer to gathering up the courage to do this. Great article! I’m a Disneyland annual passholder and went into the park by myself for a couple hours while my husband was at a conference. It was actually really scary for me (major social butterfly/extrovert) but it was super liberating. I noticed so many more details since I wasn’t yammering away at someone – I saw the park in a totally different light. I keep saying I need to take the plunge and do a completely solo trip… I just might try it now! Thank you for your great information and sharing your experience! You are my kind of guy!! Thanks so much for sharing your experience! I’m a Disney veteran but I’m going to WDW solo for the first time this October and I am equal parts excited and anxious. My daughter and I had such a wonderful time at MVMCP this past Christmas that I couldn’t miss MNSSHP, but have to admit to a few worries about all that time alone. I, too, love Pop Century for a quick WDW fix and also plan on dining around the world at the F &W festival. Thanks for the inspiration from this solo mom! Loved your article! I took a solo trip this past Dec. and am going again in Oct. for F&W. I found table service a bit awkward so this time I am going to “graze” around the world. I love the freedom of doing exactly as I please. Costs of Traveling – accommodation is the big expense traveling solo, and gas/car rental if you are driving, but if you are flying in, solo makes no difference. Solo doesn’t make your park tickets more expensive, it doesn’t make your meals more expensive (if anything it makes it cheaper because you don’t bother with TS as much). 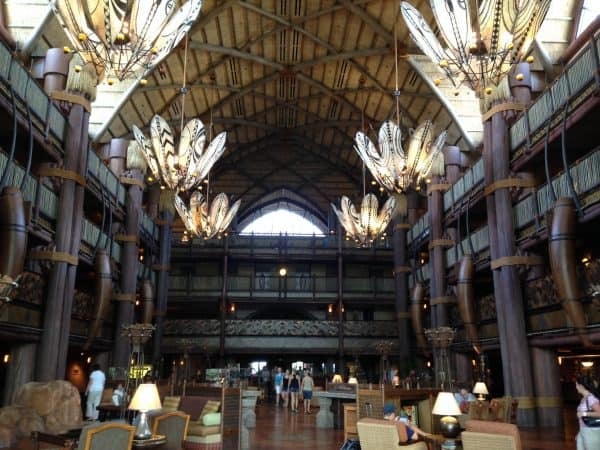 It also means if you are staying at Animal Kingdom Lodge, you can do the Wanyama Safari without any discussion or debate of how expensive it it – that is a HUGE pro to traveling solo. If you are prepared to spend the money on yourself, you don’t have to convince anyone else they should too. This is great!! I’ve been considering a solo trip for a while now and my biggest concern was not being able to share the magic as you mentioned. Maybe I’ll be brave enough eventually!!! I was in wdw with my son, mother and sister in May. I am currently in DLR solo and loving every minute of it! I enjoyed our family trip, but I am definitely more relaxed by myself. I even snuck in a massage.